Migrating to HTTPS: The what? The why? The when? Technology is consistently advancing at a really fast pace. From our login details of any account to our credit card credentials, all the details are collected and processed on the web. On these lines, the PCI-DSS council mandated that all payment processors and anyone who conducts their business online should move to HTTPS. 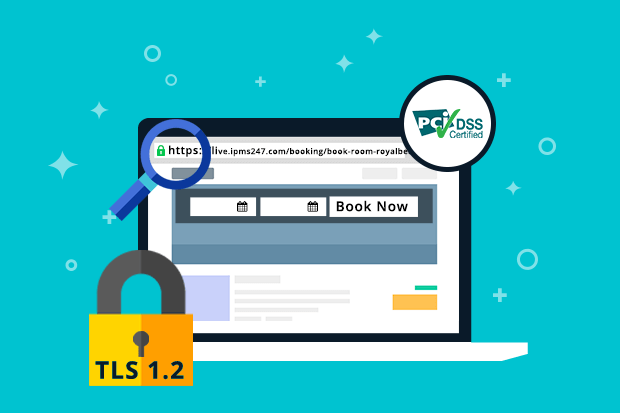 Now currently, you might be experiencing a wave of migrations from HTTP to HTTPS and a lot of jumble for the TLS updates. But ever wondered, what exactly is the benefit of these updates? And why are they required? Let us explain you the in and out of this migration. To start with, what is PCI-DSS? The Payment Card Industry Data Security Standard (PCI DSS) is a set of requirements designed to ensure that ALL companies which process, store or transmit credit card information maintain a secure environment. PCI-DSS standards are applicable to all organizations or merchants, regardless of size or number of transactions, that accept, transmit or store any cardholder data. If any customer of that organization ever pays the merchant directly using a credit card or debit card, then the PCI DSS requirements apply. The hospitality industry is highly vulnerable to the cyber attacks mainly because of a large number of transactions. The hoteliers use to keep card data in several different places: reservation system, third-party partners, the front desk, emails, and card authorization forms – the POS software and PMS (Property Management Systems) software. So, there are simply too many places where card data is vulnerable to theft and intrusions are possible. Once a hacker has hacked a software application, they can remain logged into the system for days, months or even years, without being discovered. When they are in the system it is not just credit card information that is at risk but also personal information of your guests; such as names, addresses, ID numbers, and passports. All this data is not stolen by hackers only to be used for a purchase, but also to be sold. In the hospitality industry where very few vendors are PCI certified, there appears ambiguity over being PCI compliant and PCI certified. It is significant for hoteliers to check whether the vendor is certified by a PCI council appointed QSA and not just PCI compliant. Now, what will happen if the hotels don’t follow the PCI-DSS convention? All your guest’s data is at risk. Your system or software will be not PCI-DSS compliant. Your data remains vulnerable to data-breach. If the data breach happens, your ability to process credit cards will get terminated. You might have to incur a huge amount of fine. In a nutshell, being PCI compliant is the only way to avoid unwanted security breaches against your company and customers. On the same lines, it is very essential for the hoteliers to carry out all the actions required to be a PCI-DSS compliant. Thereby, deliver a secure experience to your customers and make them feel confident about transacting with you. Eventually, security is just another important part of providing a stellar customer experience. eZee always sets the best leg forward by encompassing solution to each and every problem of the hotel industry under its umbrella. On the same lines, we never compromise when it comes to security. With the prime focus on data safety, we’ve kept on raising security measures from time to time. That’s why we’re upgrading ourselves as per the latest PCI-DSS certification and working day and night to deliver the most secure solutions in the industry. And worry not, as you’re not alone in this! The much awaited eZee NextGen 7.0 is coming soon!